Hang the wind spinner, or eye catcher, in the breeze and watch it spin! 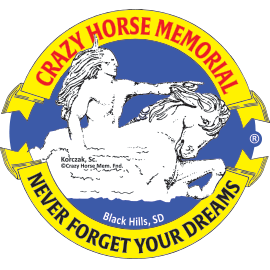 A current photo of Crazy Horse Memorial is on one side and Korczak and Ruth Ziolkowski is on the other. Indoor/Outdoor. Durable powder coated steel. Resistent to scratches, UV dmage, fading and flaking. Ships flat but directions on how to bend are included. Available in two sizes - 6" and 10". Made in the USA.